Today I want to share a Thank You Friends card as a thank you from me to you! It’s been quite the experience for me to share my creativity with you all this past year. I appreciate all of your kind comments and checking out my posts on the blog. I hope it inspires you to create and send out those some handmade notes to your friends and family! Throughout the past year, I hope my step outs helped you get some good tips and tricks along the way 🙂 Here are my last set of steps! Following along the above steps, you can see how I “built” the card. 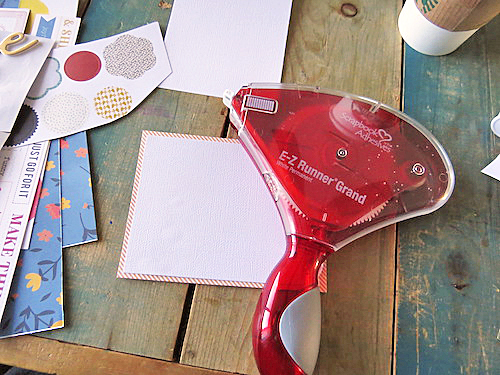 Begin with a patterned paper card base and add a white cardstock layer. Make sure to leave a border of the card base peeking through. Then add a patterned paper layer. Apply 3D Foam Squares White in Small on the backs of the die cut flower centers to create dimension for the card. Then place on top of the flower die cuts. Make as many as you’d like. I created two. Set aside. Layer a few paper layers such as a vellum layer and two patterned paper layers. Along with circle accents in between. Adhered all and the dimensional flowers with the E-Z Runner® Grand Refillable Dispenser. 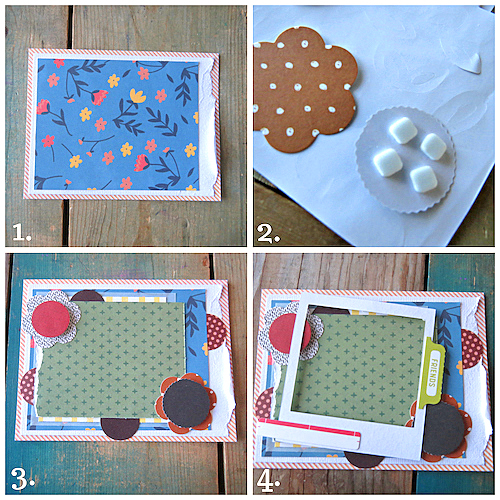 Add the frame with 3D Foam Squares White in Small to add some dimension to the card. Tab and label stickers were added to the frame. In the final image above, you can see alpha stickers, sequins (secured with the Dual Tip Glue Pen) and other embellishments were used to finish the card. Thanks for letting me inspire you today and during this past year. Be well and keep crafting! This entry was posted in 3D Foam Squares, Adhesives, Beginner, Cards, Crafts & Tutorials, E-Z Runner® Dispensers, Other Adhesives, Permanent Adhesive, Skill Level, Tutorial and tagged 3D Foam Squares Mix White, 3D Foam Squares Small White, Adhesive Dots Micro, Card, Card Making, Dual Tip Glue Pen, E-Z Runner Grand Dispenser, E-Z Runner Grand Permanent Strips Refill, HomeHobby by 3L, Shannon Morgan, Thank You, Tutorial. Bookmark the permalink.